Shinola watch company was established in 2011 and is owned and operated by Bedrock Brands, which is a privately owned Texas investment group. The company purchased its name from an early1900's shoe-polish brand called Shinola. It was launched by Tom Kartsotis, one of the founders of the Fossil Group. Shinola moved into a former General Motors design lab in Detroit to build the watches.The big hype is it was "Built in Detroit" and it is "Made-in-America." 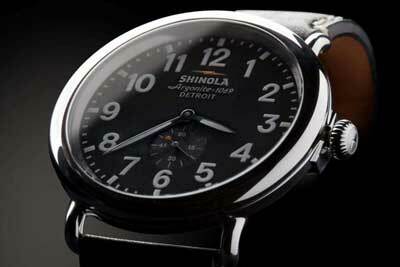 Marina Bay Watch Company proudly provides extensive service and repair on Shinola watches. We take pride in servicing your Shinola and we always make sure your repair meets Shinola Factory Specifications. We provides extensive service and repair on Shinola timepieces including for: mechanical wind, self winding, or quartz watches. Shinola watches are well engineered and designed with great quality and reliability, but sometimes it may still need to be fixed or serviced. Trust our experts for any of your Shinola timepiece repairs and services. We are here to help you fix any of your Shinola watches.